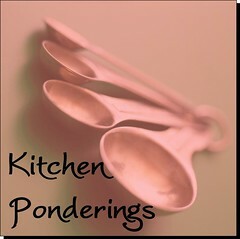 Pondered in my Heart: Everything's Comin' Up Roses! 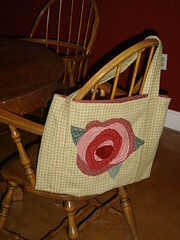 I made this tote bag for a dear friend of mine who loves roses. Being a "creativity junkie", I'm always trying new craft hobbies. I have to discipline myself so that I don't overspend on supplies. Since I am a novice seamstress, I can't afford to spend a lot on fabric, so I spent the summer collecting fabric from garage sales & from my mom. The plaid shown here is leftover from a futon cover we had made several years ago. I had TONS of it, as we bought all that the store had left from the clearance section for use in future decorating projects. I no longer have the futon, but I've made several things with this fabric! The red & green scraps are all from the stash my mom gave me. I didn't have the right color of olive thread, so I chose to use red to match the contrasting fabric. I didn't use a pattern for this bag, I just "eyeballed" it. I love the freedom of sewing without a pattern. Here's a detail of the rose. I got the idea for the rose from this sunshine bag, created by iSew. Check out her blog and her etsy shop for cute "Handmade Handbags, Gadget Monkeys & Baby Gifts". Very cute! And I love how you used materials you had! I love it. It's so fun to be a bit more loose sometimes, isn't it? I love that you used something you had on hand as well. I have soooo much fabric. I could never use it all. Thanks for mentioning me too, that's super nice.